Dr. Adrian Brown, a planetary scientist working at NASA Ames Research Center and the SETI Institute, will present a plenary talk about “the Martian Water Cycle” at the 19th Annual International Mars Society Convention, scheduled for September 22-25, 2016 at the Catholic University of America in Washington, D.C.
Dr. Brown’s field of expertise includes the planet Mars, astrobiology and remote sensing spectroscopy. His current research focuses on the analysis of data from the Mars instrument “CRISM” (Compact Reconnaissance Imaging Spectrometer for Mars) which is onboard the Mars Reconnaissance Orbiter currently circling the Red Planet. 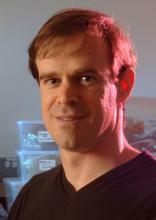 Born in Australia, Dr. Brown received a Bachelor’s degree in Electrical Engineering from the Australian Defense Force Academy, a Master’s degree in Computer Science from the University of New England (NWS) and a Ph.D. in Earth & Planetary Sciences from Macquarie University in Sydney, Australia. For full information about the upcoming Mars Society convention, including registration details, the speakers list and hotel accommodations, please click here.